Do you live in Lansing or Okemos and need a Divorce Lawyer? The Basiga Law Firm specializes in handling divorce cases in the Okemos and Lansing Area. Divorce is difficult and challenging to all parties involved, including any children. Whether you are the person who decides to file for divorce or the spouse who is being served with divorce papers, your entire world is being turned upside down. The entire process is an emotional roller coaster from start to finish. You need a lawyer who can help navigate you along the roller coaster. During the course of the divorce, sometimes you may need a listening ear while other times you need someone to voraciously fight for your rights. In addition, you may need a detailed eye to help sort out your assets and to figure out what can be done to preserve your financial future. Basiga Law Firm will be there for you to navigate the roller coaster and will help you with all your needs along the way. Do I have to move out of my house when getting a divorce? Are the Courts going to take my kids away? What is going to happen to all of my assets? Each family law situation is unique and there is no “standard” answer to any of these questions. A lawyer at Basiga Law Firm can provide you with answers to these questions and can make sure you aren’t taken advantage of during your family law case. Before you make any decisions or agree to any arrangement with your spouse, you should consult with an experienced Lansing divorce lawyer. The decisions you make today can have long lasting impacts on your entire divorce case and your future. Contact our experienced divorce attorneys today to consult in your case. What is the general process of a divorce in Michigan? A divorce begins when one spouse (called the “Plaintiff”) files a Summons and Complaint, a Complaint for Divorce and any other necessary paperwork with the proper Circuit Court. 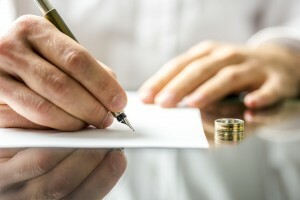 After the Summons and Complaint, Complaint for Divorce, and any other paperwork has been filed with the Court, these documents are then served on the other spouse (called the “Defendant.”) Service can be completed by your spouse coming to your lawyer’s office to receive the papers, sending the papers via certified mail (your spouse will have to sign for them), having a process server or another adult hand deliver the documents to your spouse or having your spouse’s lawyer (if they have one) agree to accept service of the papers on your spouse’s behalf. The Defendant has 21 days from the date he or she receives the Summons and Complaint to file an answer with the Court. The answer will respond to each paragraph in the Complaint for Divorce, and will either agree with the statement made, disagree with the statement or remain neutral about the statement. The answer tells the Court that the Defendant wants to be involved in the legal process. If the Defendant does not file an answer to the Complaint for Divorce with the Court, this means the divorce is uncontested. After the required waiting period has passed, the Plaintiff can ask the Court to enter a Default Judgment. The Court can accept all of the allegations in the Complaint for Divorce as being true, award the Plaintiff items asked for in the Complaint for Divorce and grant the divorce. What is a no-fault divorce in Michigan? Michigan is a no-fault divorce state, which means the Court cannot look at fault to determine why there is a divorce. Therefore, you will not have to prove adultery, abuse, abandonment or anything else to file for divorce. Even though a Court cannot consider “fault” for the reason for the divorce, “fault” may be relevant during divorce negotiations and considered by the Court regarding custody, division of property, alimony/spousal supporter other issues. In addition, your spouse does not have to agree to the divorce. His or her dissent will not have any impact on the Court’s decision, but each party has the right to express his or her views. You or your spouse are required to be a resident of the State of Michigan for at least 180 days (six months) before you can file for divorce. In addition, you or your spouse must be a resident of the county in which you file for divorce for at least 10 days before you file. Where do I file for divorce in Michigan? Divorces are filed with the Circuit Court in the county where either you or your spouse are a resident. The Family Division of the Circuit Court specifically handles family related matters such as divorce, custody, paternity, juvenile issues and adoptions. Is there a waiting period before a divorce is final? When there are no minor children of the parties, Michigan has a 60 day waiting period before a Judgment of Divorce can be entered by the Court. If you and your spouse have minor children together, the waiting period is 180 days before a Judgment of Divorce can be entered by the Court. The waiting period begins on the date the Summons and Complaint is filed with the Court. Although these waiting periods exist, it is common for divorce proceedings to take longer than either of the waiting periods.Our attorneys will keep you up to date on your case and will ensure that you know of any potential delays. We will also advise you as to whether or not the circumstances of your case will allow you to ask the Court to waive the waiting period. Child support is a financial obligation that both parents have for their child. It applies to any situation where there is a child – divorce, paternity and other cases. The attorneys at BLF will help you navigate the system and will advise you on issues surrounding child support in your case. Child support continues until the minor child reaches the age of 18 or graduates from high school, whichever occurs later, but under no circumstances beyond the age of 19 ½ years. What is the Friend of the Court (FOC)? The Friend of the Court (FOC) is part of the family division of the Circuit Court in each county. It is governed by state and federal laws, but each county in Michigan has their own FOC. The FOC does not become involved in a case until an action is filed with the Circuit Court. FOC handles the collection, enforcement, and investigation duties in domestic relations cases. FOC is also responsible for enforcing Court orders, including orders for child support, medical support, alimony/spousal support, custody, and parenting time. Parties may elect to opt out of the services provided by the FOC. Whether you should consider opting out of the FOC services is a personal decision that should be determined on a case-by-case basis.It is important to have an experienced attorney advise you before “opting out” of these services. Depending on the county where your case is pending, your first interaction with the FOC may be to attend a Conciliation Conference. At the Conciliation Conference, both parties meet with the FOC representative. The representative can essentially act as a negotiator to try to reach a mutually agreeable resolution between the parties regarding child support, custody and parenting time. At the conclusion of the Conciliation Conference, if the parties do not mutually agree, then the FOC representative will make a written recommendation regarding child support, custody and parenting time. Each party and their lawyer havean opportunity to review the recommendation and to object to the findings. If one party objects to the recommendation, then a hearing is scheduled before the judge. How is my property going to be divided? In Michigan, there is a presumption of equitable division of marital property. A Court can depart from this presumption, but must explain the reasons for doing so in a case. Marital property generally means property accumulated during the marriage as a result of one or both parties’ contributions or efforts during the marriage. Certain property, such as pre-marital property, gifted or inherited property may not be included as marital property. Determining whether property is marital or separate property and the value of that property can be a long and complicated process. Basiga Law Firm’s lawyers will guide you through this process and will advise you how to protect your assets. Why should I hire a lawyer to handle my divorce, when there are websites with free legal forms? There are thousands of websites that claim to have the ability to file and to handle your own divorce. They provide legal forms for free or for a minimal charge; some will even assist you with completing and filing the forms. These are “one size fits all” websites. However, every family is unique and faces different challenges when navigating the divorce process. A website cannot provide the personal attention your family deserves when facing this challenging time in your lives. You need a lawyer who cares about your family and who is well-versed to help you with the maze of forms, legal terminology, procedures, and questions you will face. Our team at BLF will help you face these challenges and will be stand by you throughout each step of the process.